I do love that moment when you hear one of your favourite authors has another book due to be released. 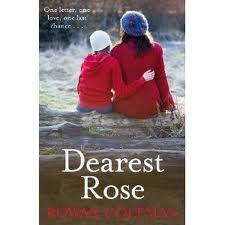 It is no secret that one of my top authors is Rowan Coleman so when I received an early review copy of Dearest Rose I was ecstatic and I wasted no time in getting started. When Rose Pritchard turns up on the doorstep of a Cumbrian B&B it is her last resort. She and her seven-year-old daughter Maddie have left everything behind. And they have come to the village of Millthwaite in search of the person who once offered Rose hope. Almost immediately Rose wonders if she's made a terrible mistake - if she's chasing a dream - but she knows in her heart that she cannot go back. She's been given a second chance - at life, and love - but will she have the courage to take it? The author has brought us a fantastic wide mix of characters in this book. Our Heroine Rose is such a vulnerable and delicate character who is full of emotion and yet hollow at the same time. Her life and her story is heartbreaking and the only thing bringing light into her life is her daughter Maddie and a postcard from a stranger who she hopes to meet again someday. I love Maddie she is such an unusual character you can’t help falling for her quirkiness and yet again the heart strings are pulled when you find out the reason she is how she is. This book has been written beautifully with heartbreaking and raw emotion on every page but the storyline feels so delicate and tender it must have been very difficult for Rowan Coleman to write this book but I know that her hard work will pay off with this book. Shona brings a little light to the book when she arrives to give Rose a helping hand and this was needed in this book just to bring a little humour to an incredibly touching book. This is completely different from the authors previous books but it is obvious that this has been written right from her heart. I do not usually read books about abuse as unfortunately there is enough of that in the real world but I had to read this and I am so glad I did for once I do not feel my words can do this book the justice it deserves. Rowan Coleman had brought us a heartbreaking and truly compelling read that is full of raw emotion and pure courage. I highly recommend this book along with a box of Kleenex but one thing is for sure I won’t be loaning my copy out this one is here to stay on my shelf !